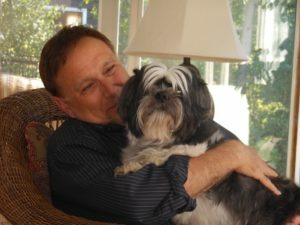 9am Sunday: Stephen Kuusisto, (bio below) author of “Have Dog, Will Travel: A Poets Journey” will guide poets and prose writers on the techniques that help us write with clarity and honesty about animals. The aim is to avoid anthropomorphism and instead find ways to write with the real animal in mind. Cost $50. Limit 20 participants. Workshop 2, 9-12N Sunday: Writing in the Woods. Tim McNulty and Bob Rose. Cost FREE to Gold Pass holders who are registered in advance. Limit 15 participants. Workshop 3, 9-12N Sunday: Becoming Cascadian: Imagination of the Senses. Nadine Maestas and Jared Leising host a workshop on the Washington State Ferry. This two-hour generative workshop will engage your imagination through a sensory experience of Cascadia while riding the ferry to Friday Harbor and back. Participants will meet at the Anacortes terminal and purchase a ferry ticket. The workshop is open to the first 30 Gold Pass Members who register.